If you would like to make a nice, realistic looking doll house doll or family, look at this post in Casey's Minis. 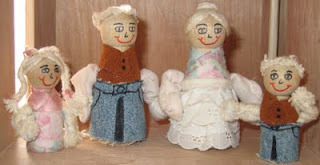 However, if your goal is just to make some playable people for children, these homemade wooden dolls have always been the most popular when we have kids visiting. Maybe it's the fact that they're heavy and don't tip over, or maybe it's the fact they make a nice "clunk clunk" as they march around the house... whatever it is, quirky though they be, they have always been the people of choice for playing "dollhouse"! * If you do not want arms, skip this step and the next step, but if you do, drill a hole through the body. * Take some yarn the color you want the arms to be and braid it together with some pipe cleaner... thread it through the hole and you've got moveable, poseable arms. (I doubled the ends of the pipe cleaner over so that there wouldn't be a sharp metal point in their "hands".) Tie a piece of string tightly around the end of the arm to keep it from unraveling. * Take small fabric scraps and glue around the figure. I used a black permanent marker to draw a "gap" on the man and boy's bottom half to make it look more like pants. * Paint or draw a face on the head. * Glue yarn on the head for hair. If you want a girl with braids or pony tail, cover the entire head with yarn, then make braids separately and glue them on. Very charming and too cute. Thank you for sharing.